I am a French artist born in 1983, living and working in Reykjavík. I graduated with degrees of Bachelor of Applied Arts in Laval, Master of Fine Arts in Rennes and Licence of Cultural Mediation in Paris. 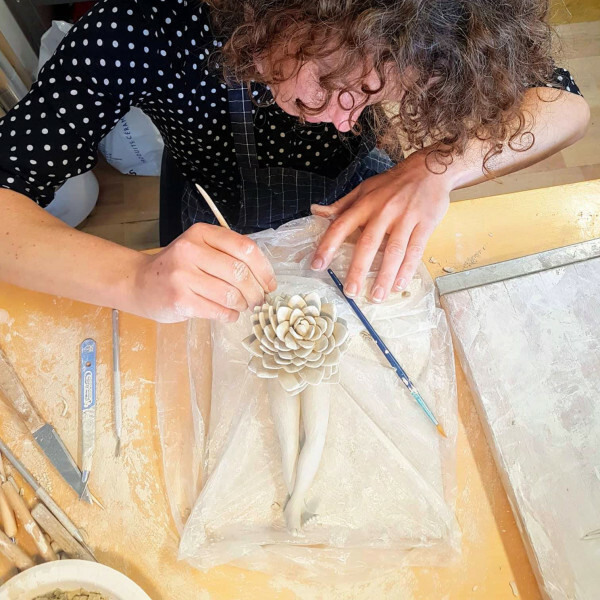 After CAPES of Fine Arts degree and work experience in schools, cultural centers, museums and castles, I am currently teaching Fine Arts at Alliance française of Reykjavík and giving ceramic workshops at Listastofan art space where I am co-director and studio-manager. During my studies, I experimented consecutively in photography, video, installation and performance. From 2008 I focused my work on drawing, sculpture and modeling. Attracted by skulls, teguments and organisms of all kinds, I am sculpting and developing a detailed graphics with repetitive and invasive forms. Between Scandinavian design and cabinets of curiosities, my work forges links between elements of nature and highlights the fragility of existence, the cycle of life and death, the desires that bind us. Here lies a solid form, smooth, heavy, so fragile. Dead end, suffocation, urgency, empty, open, dig, again and again, risk, touch the limit, do not break. Slow down, gently, smooth, caress, relieve. Close, feel light, reborning, full of this emptiness. one, two, three, twenty times, to infinity. Repeat the gesture, repeat the form, in series, but never in identical way. Unique and precious entities created with the hand and the fingertip, the forms come up and mingle in a common dance. Turn. Turn, turn to forget. To forget for a moment, to forget oneself, to lose oneself, to lighten oneself, to fly away. It is that or you fall. You fall and risk the fracture. take care of your guts and brood the world of the strength to be yourself.